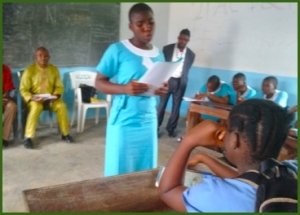 The launching program of the DI Project for the Littoral Region took place from the 30th – 31st of October 2014 at Atlanta Bilingual Comprehensive High School, Bonaberi Douala. 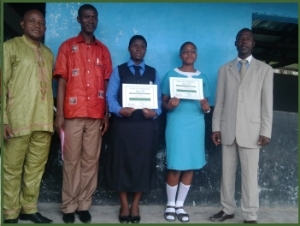 The Coordination meeting and training of trainers’ seminar with representatives of selected schools took place on Thursday 30th October 2014 with three schools out of the four selected: Atlanta Bilingual Comprehensive High School, (ABCHS)Bonaberi Douala; Presbyterian Secondary School (PSS) Douala andCollege Bilingue Bonchouo (CBB). 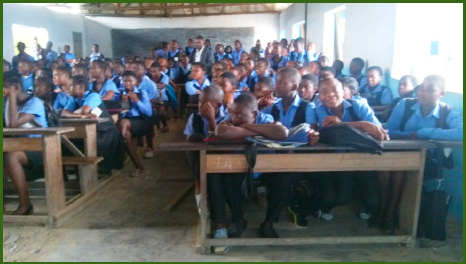 The official launching ceremony of the project for the Littoral Region took place on Friday 31st October 2014 at the premises of Atlanta Bilingual Comprehensive Secondary School Bonaberi, Douala. The major highlights of the ceremony were: a welcome address by the host principal, Mr. NSOTAN Richard; a drama on the fight against corruption presented by the Democracy and Good governance club of PSS Douala; the award of participation certificates to participants of the regional training of trainers’ seminar and the presentation of the project to all in attendance by the National Coordinator of the DI Project, Mr. FON.